The online tutorials provide access to all features and materials that lecturers and students need for a course. A course's own proven content can be added at any time. Using the platforms, you can always easily communicate with your students, make announcements, share information or give homework. Lecturers can choose from a wide range of tasks to create homework, exams and tests, and assign them to their students. An automatic correction function minimizes time requirements. In a transparent performance overview with numerous analysis options, you can view the results of your students at any time.This will give you valuable feedback on the issues in which your students need additional assistance and you can optimize your sessions using the principle of Just in Timeteaching. Each MyLab and Mastering product provides access to the associated textbook in eText format. Numerous additional digital learning aids such as computer graphics tools, videos, animations, simulations, experiments and many more explain and illustrate the textbook content. Here you will find a complete overview of all available products. 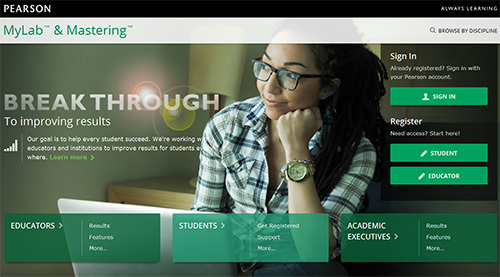 Why do lecturers value Pearson MyLab and Mastering? "I have used MyCommunicationLab in my lecture - and the students loved it! They could easily access the textbook chapter as an eBook from anywhere and the numerous exercises and quizzes allowed the practical application and reinforcing of the lecture contents through self-study. Especially helpful are the videos in which different communicative situations are demonstrated, an ideal supplement to the role-playing games which we carry out in class"
"For me, the multiple-choice questions in MyAccountingLab are essential. In this way, students are able to check their knowledge through self-study. Even incorrect solutions to the multiple-choice questions often provide good information, which is very useful for self-regulation. If you do not understand the underlying issue at all, you also have the possibility to access the book via eText, on precisely the essential page." "I decided to get MyEconLab because I wanted to make sure that the students work through the subject matter continuously throughout the semester and not just three days before the exam. MyEconLab ensures exactly this: The assignments (with fixed dates) enable students to practice the material parallel to the lecture, so they are always up to date. The feedback from the students has been very positive; they perceive the exercises to be helpful. " "The German translation of the proven English textbook Thomas' Calculus - namely the Pearson Series Analysis 1 and Analysis 2 - sets itself above the rest with unique teaching methods and is designed with excellent graphics in both volumes. These books are highly suitable for self-study, especially since they are precisely complemented by the modern e-learning platform MyMathLab. For our long-distance university Master's course inElectrical Engineering and Information Technology (www.online-master-eit.de), this series therefore offers an extremely successful introduction to Engineering Mathematics. Therefore, we have integrated this interactive teaching tool as an independent preliminary course in our online master's program. " 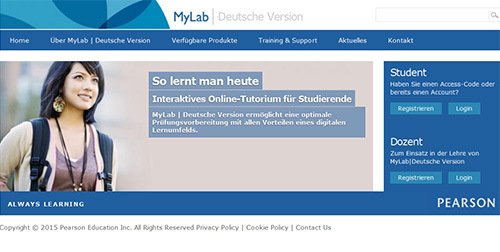 MyLab | German Version creates optimal conditions for both independent exam preparation for students as well as for the blended learning approach in courses. 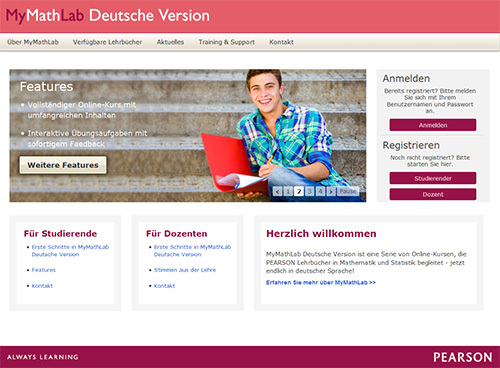 Since 2014, MyLab | German Version has been available for German textbooks in economics and natural sciences. MyLab | Deutsche Version is optimized for use on tablets (iPad, Android) - for greater mobility and flexibility in learning. MyMathLab German Version, supplements the German Pearson textbooks in mathematics and is particularly suitable for students of economics, natural sciences and technology courses. A variety of examples with step-by-step instructions and exercises with hints contribute to better understanding and support students while practicing mathematical skills. With a task manager controllable by the lecturer with an automatic correction function and diverse analysis options, MyMathLab German Version is perfectly suited to accompany any such course. The Pearson MyLab- and Mastering platforms are online tutorials in the English language. Flexible, intuitive, interactive and easy to use, they offer a variety of innovative learning resources and support students in understanding and practicing the study material. Lecturers benefit from a powerful task manager to create homework, tests and examinations, and a transparent performance summary of the results of their students.